I just love these three new listings. I'd be proud to call any one of them my forever home. The first, at 227 Lambert Road, is definitely what you'd call a "forever home" It is a beautiful home on a beautiful flat property beside a picturesque river about a block from the Country Club. 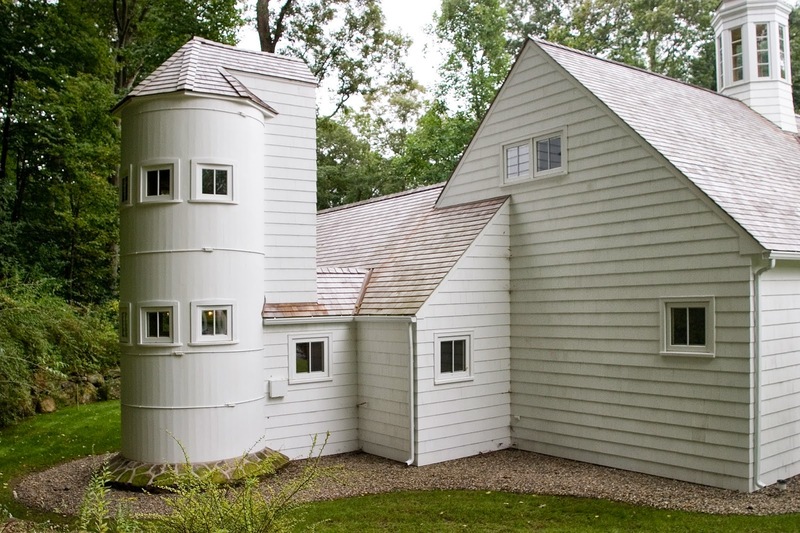 Alongside the home are three of the most beautiful barns you've ever seen. The first is currently set up as an exercise studio. The second is a two bedroom apartment for guests. And the third barn is whats known as a"party barn" because it has got everything you will need to throw the party to end all parties. 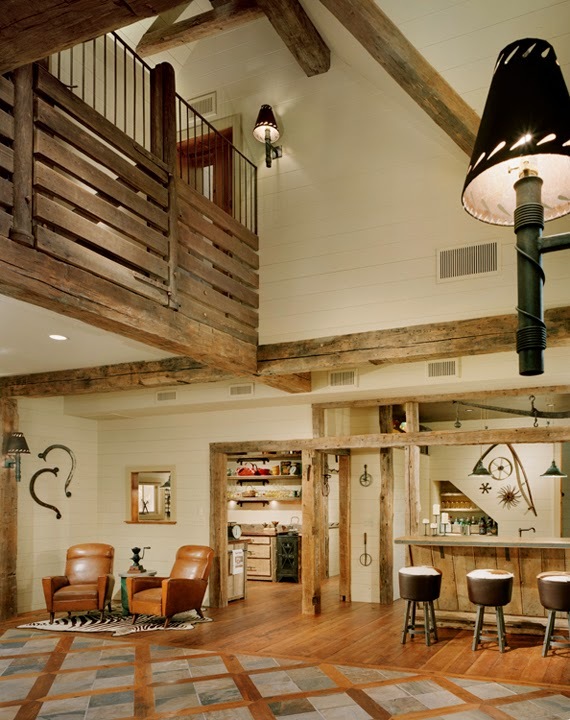 Inside, under high ceilings and massive beams is a bar area, a full chef's kitchen, large screen TV's, and a massive sliding barn door that opens to let the party spill outside. Downstairs is enough room for 20 square dancers. Or, a trading floor. Or, a Zumba studio. Upstairs is sleeping accommodations for what seems like half a dozen guests, at least. While on the one hand this compound of interesting buildings appeals to a certain nostalgia we all have for the house in the country that is not too big, not too small, with great fireplaces, old reclaimed barn-wood floors and full of interesting spaces and character, it also appeals to our more modern needs for an open floor plans, high ceilings and space to get away from everyone. After all, sometimes you just want to go dancing, or exercise, or watch a movie or play music with the sound all the way up. That's what the barns are for. The second house is practically in the middle of town (although you'd never know it!) 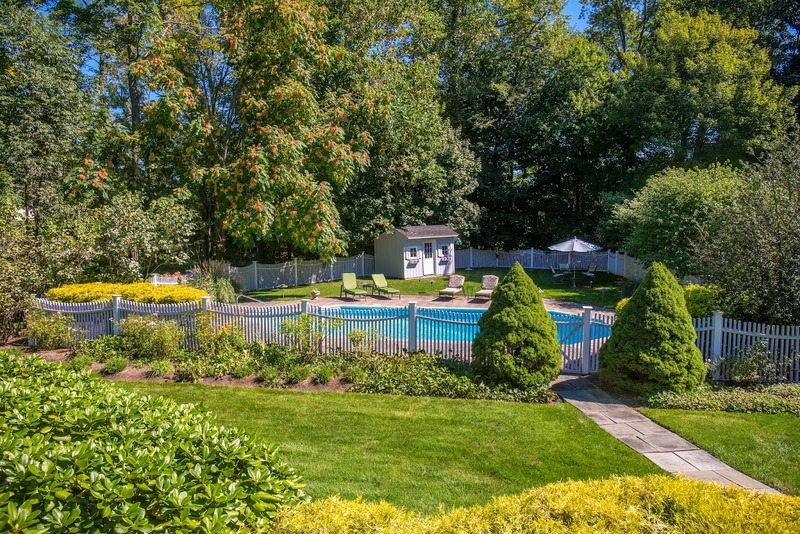 Hidden behind an electric gate this vintage 1938 colonial sits on one acre with a pool only steps from the village and train station. I promise if you live here you are definitely close enough to walk to the train and walk home from the bars. The house was home to several stars over the years. Mary Martin, the original Peter Pan on Broadway, lived here in the 1950's with her teenage son, Larry Hagman, who would later play Major Nelson on "I Dream of Jeannie" and later J.R. Ewing on TV's Dallas. Thirty years later Academy Award winning actress Claire Trevor bought this house and added the first floor master bedroom suite, an elegant suite which is today as elegant and far more tasteful than anything you'll find in Beverly Hills. 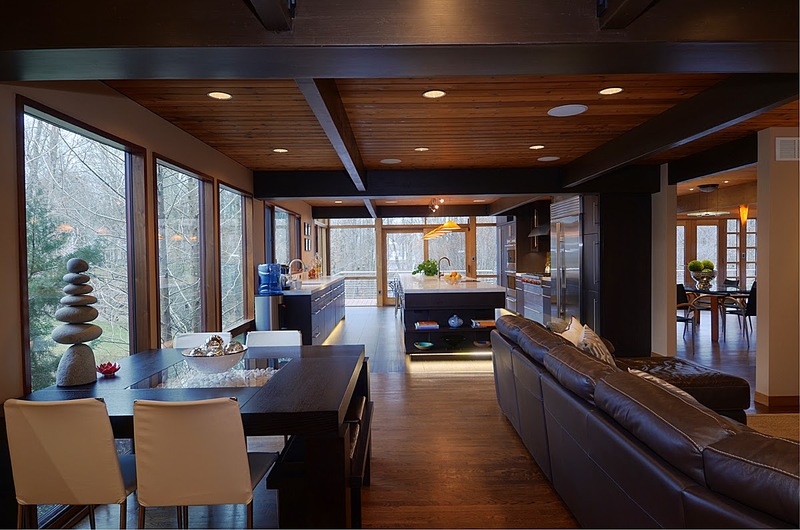 Finally, this stunning modern home on 93 Graenest Ridge Road in Wilton is the surprise of the group. Unassuming when you approach coming up the driveway, this house of wood and stone really opens up on the sides and rear with walls of glass to let the light and feeling of nature inside. I think this is going to appeal to someone coming from the city who just wants to get away from the bustle and is drawn to the sophisticated design and the private setting. And, what they'll discover is that there is a secret trail through the woods to the restaurants and shopping of downtown Wilton center. That combination of both style and privacy with such proximity to the best of Wilton makes this house completely unique on the market. When Is the Best Time to LIst Your Home? 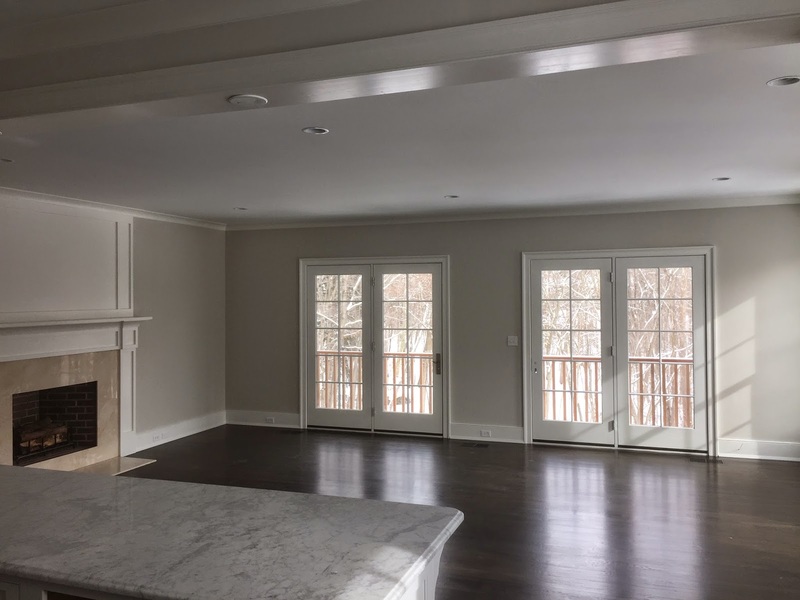 Nearly finished, these two townhouses on Main Street in New Canaan are ready for viewing. 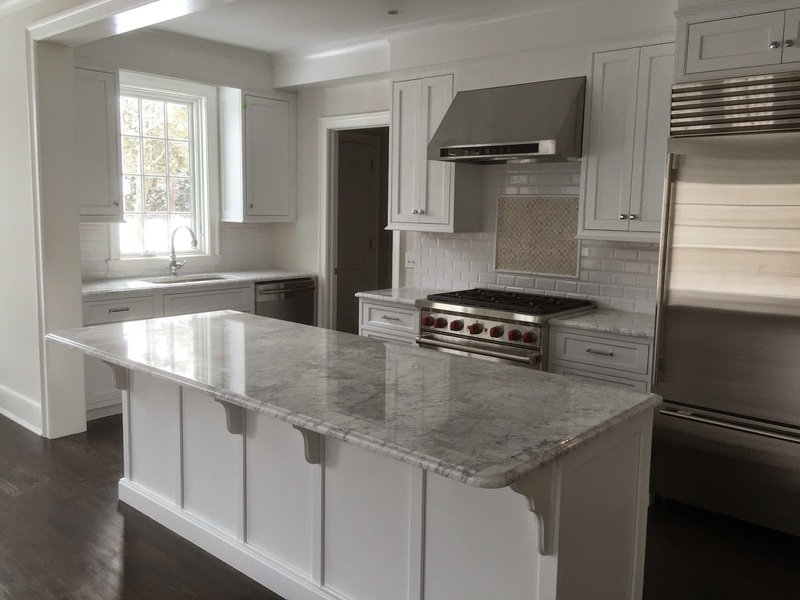 The kitchen in this new townhouse features a Carrera marble island, Sub-Zero refrigerator, Wolf range and a smaller stainless steel beverage fridge near the sink. The room off the kitchen can be used as a laundry room, mudroom or office. The great room with double French doors and Juliet balconies with a view of the woods and pond. The third floor sitting room and fourth bedroom with ensuite bath. 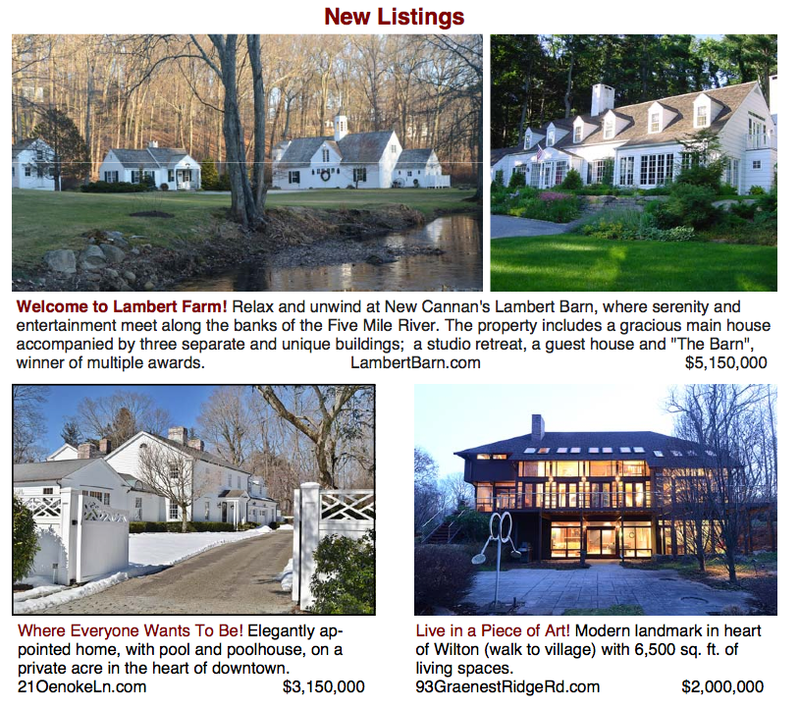 227 Lambert Road Farm: Is it Time to Buy Your Forever House? Relax and unwind at New Cannan's Lambert Farm, where serenity and entertainment meet along the banks of the Five Mile River. The Farm includes a gracious main house accompanied by three separate and unique buildings; a studio retreat, a guest house and "The Barn", winner of the 2007 Builder's Choice Award for Adaptive Reuse. The Barn restoration houses a full kitchen, pantry, game room and two bedroom bunk lofts which sleeps 8. It is the ultimate in entertainment space. 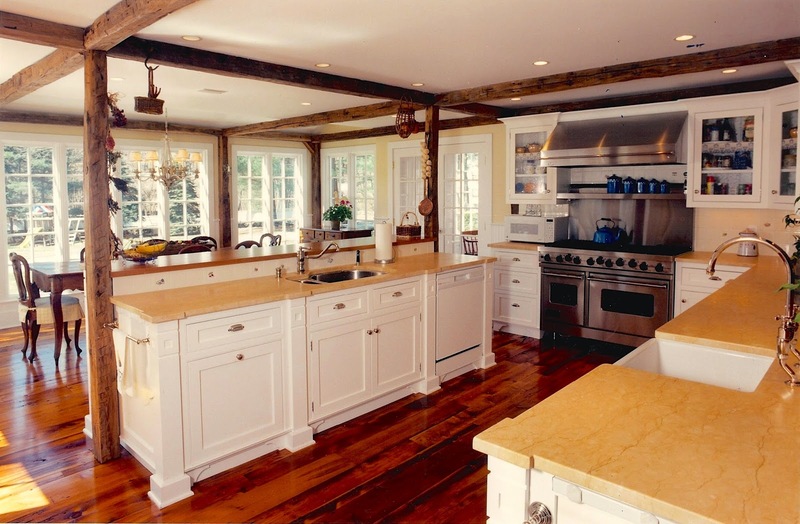 Copper counters and soapstone sinks are surrounded by period farm implements used as hardware and wall decorations. 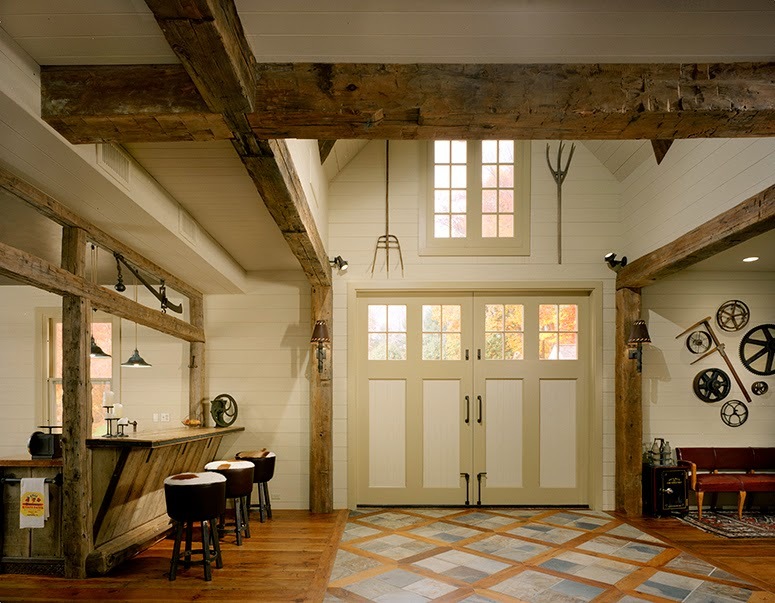 Original lumber and horse stalls were preserved and smartly incorporated into the barn to maintain the character and history of the original farm. A good time to be had by all who visit. 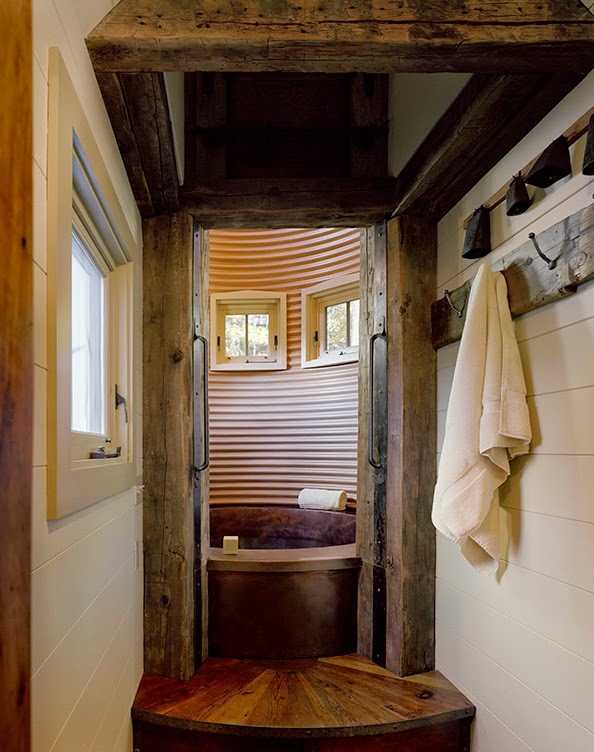 The piece de la resistance of the barn is a 30 foot silo which has been dramatically converted into a copper spun spa surrounded by radiant heated walls and topped by a copula to let in natural light. The spa was featured by Diamond Spa in their promotional materials. For the wine enthusiast, a wine cellar and sipping room hideaway can be found in the basement by following the terra cotta tiles through the rod iron gates. A well appointed one bedroom Guest House with full kitchen, full bath, stone fireplace and blue stone patio provides a separate retreat for visiting family and friends. The Studio Retreat can be adapted to be an artist studio, office, library or any other space that one desires. 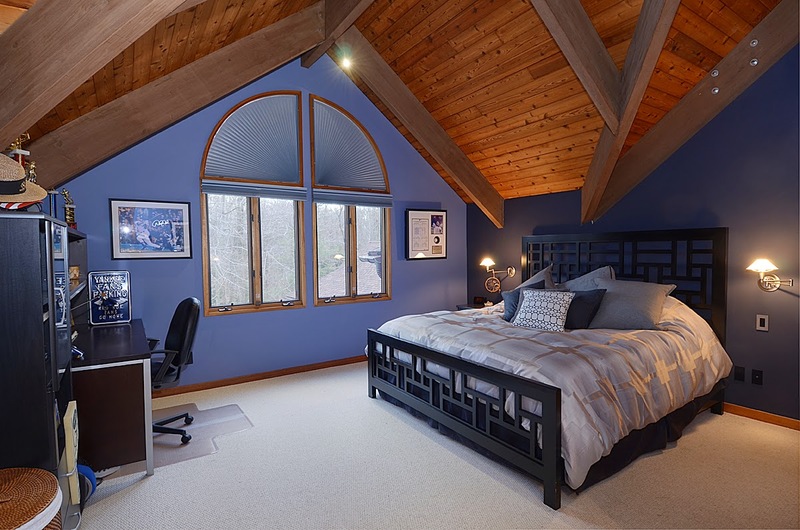 It has 14 foot vaulted ceilings and built-in shelves, hardwood floors and has heat and air conditioning. 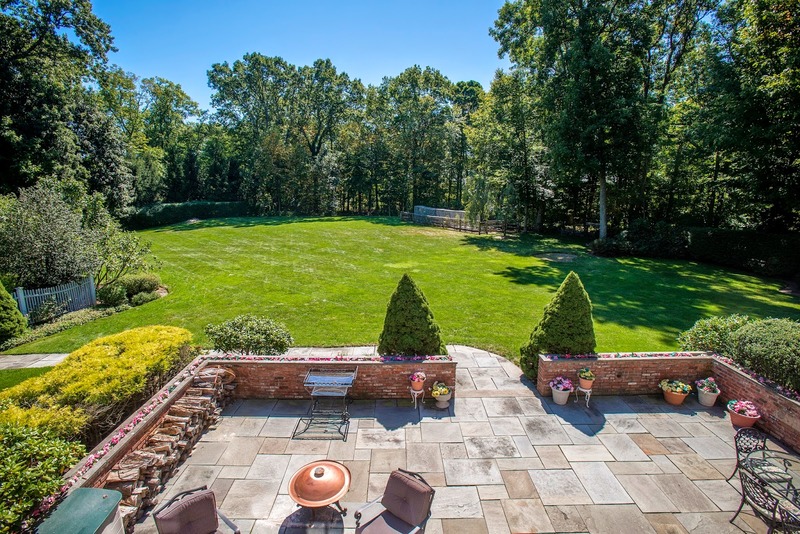 All this is waiting for you along with the sophisticated town of New Canaan, its award-winning schools, delicious restaurants, boutique shopping and express train to NYC. The 5 bedroom Main House underwent a complete renovation to add an additional kitchen to the front of the house, family room and solarium. The original kitchen was also renovated with curly maple cabinetry, gold & silver leaf ceilings and amber fixtures, and now serves as a butler kitchen adjacent to the dining room. Appliances include high-end 3 Sub Zero refrigerators, a Viking stove, and Jotul fireplace inserts. Random-width, wide board reclaimed antique pine floors line much of the main level. The warmth of the solarium is enhanced by radiant heat and African Slate floors. 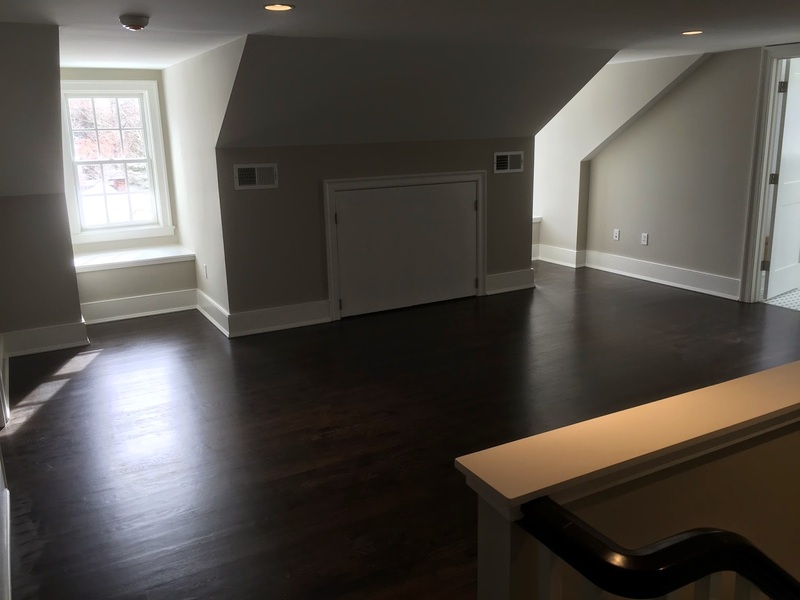 The second floor includes two bedrooms and a master suite. An office/Au-pair suite with full bath sits atop the garage. This custom brick colonial with slate roof sits privately on a PREMIER hilltop on a New Canaan cul-de-sac, just half- mile to town hall. 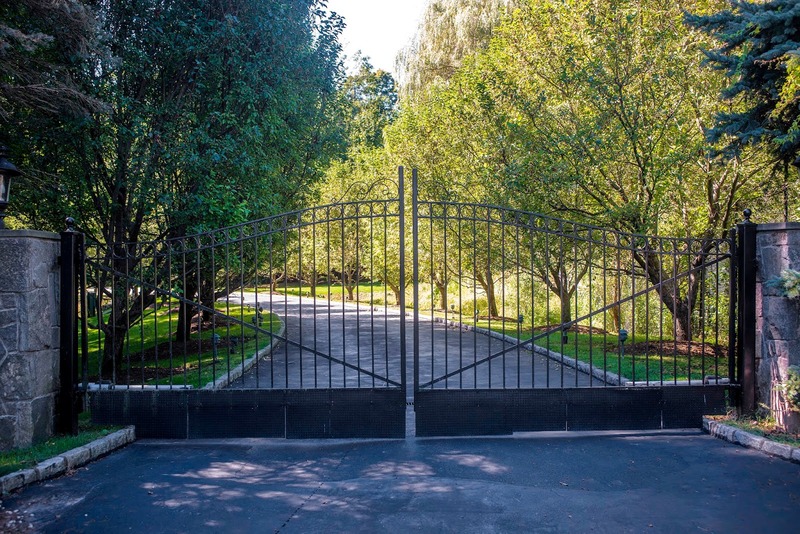 The house has a gated entry, tree-lined drive and stone-paved courtyard that opens to lush flat property with mature plantings. The sun filled first level has an open floor plan, while the 2nd floor has 5 bedrooms that includes a grand Master with fireplace, double walk-in closets & a separate dressing room. Large finished lower level has a bar, media room & gym. Entertain on a huge terrace with outdoor kitchen and pool. In the winter you can see through the treeline over the village all the way to Long Island Sound. A modern landmark in the heart of Wilton, this meticulously appointed home features 6,500 feet of light-filled living spaces, vaulted ceilings, floor to ceiling windows and extra-large rooms with open floor plan for flexible entertaining and living. 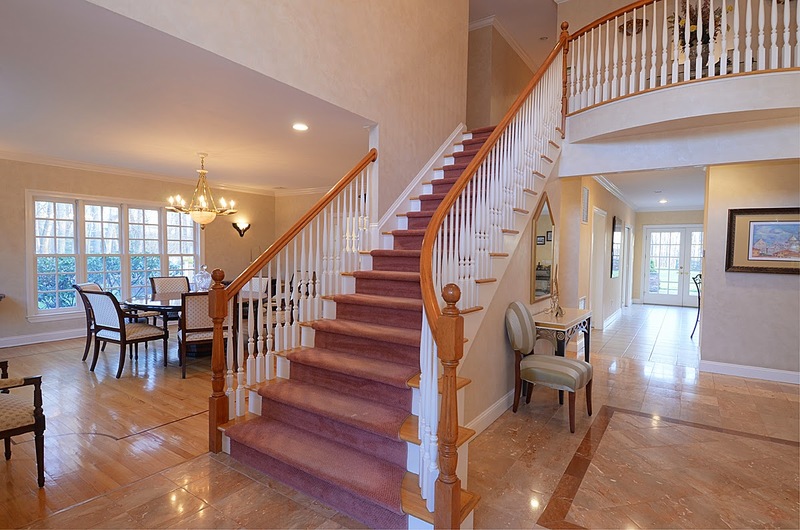 Five bedrooms, 5 & 2 half baths include a master suite w/ balcony, master bath, dressing room and walk-in closet. A separate guest suite on its own level. Beautiful pool. A complete package. 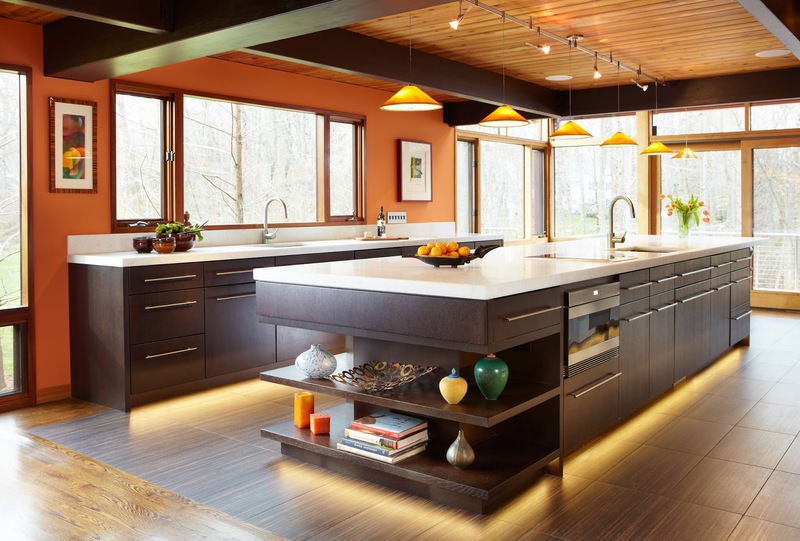 Featured in the October 2013 issue of Better Homes and Gardens, this stylish modern kitchen is a study in form and function. State-of-the art technology, top of the line appliances, sumptuous finishes and dramatic lighting create a wonderful chef workspace. 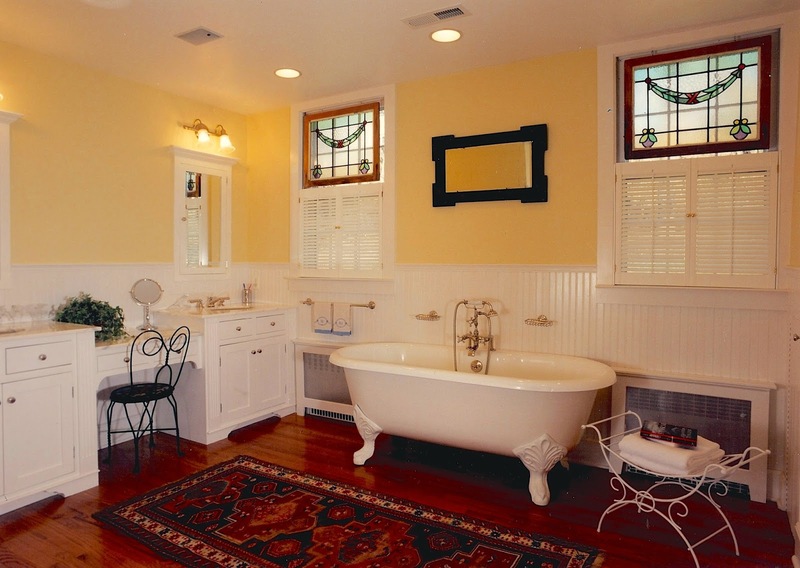 Note the Nubian brown cabinetry, Italian inset tile, and mahogany-framed windows. 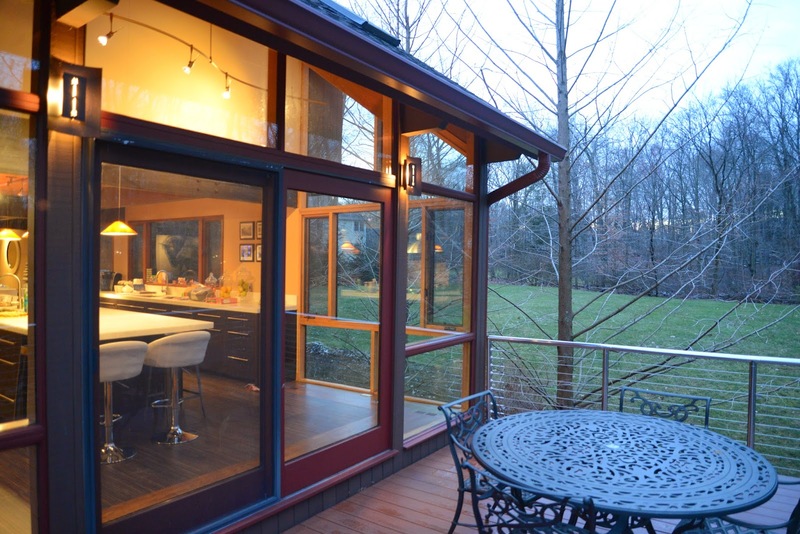 Oversize windows offer views of the patio, backyard and Bradley Park conservation land. The heart of the house is the living room, whose soaring architecture allows light to take center stage. 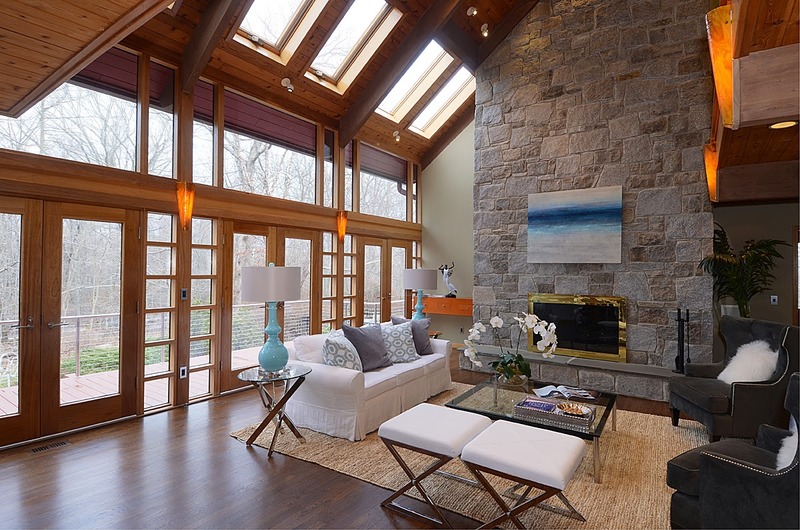 The massive stone fireplace rises up through the beams to create a dramatic focal point. 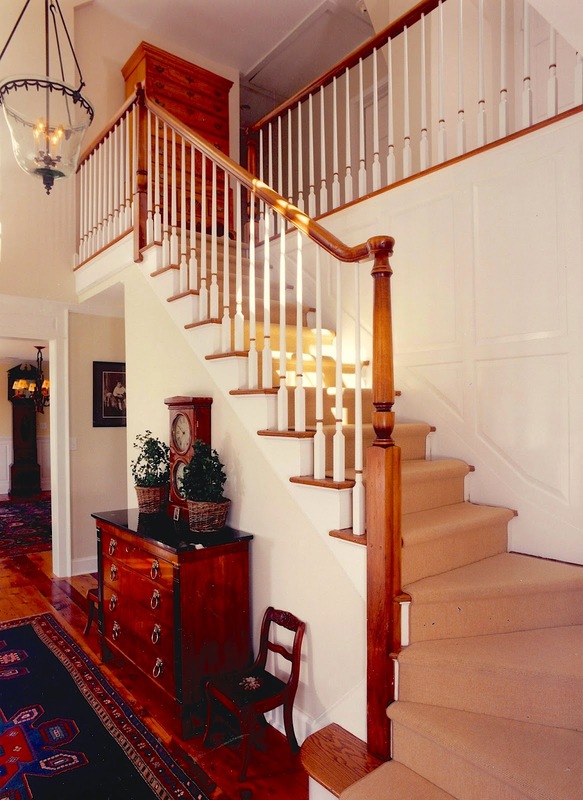 Note the stone floor and African mahogany in the two story foyer. 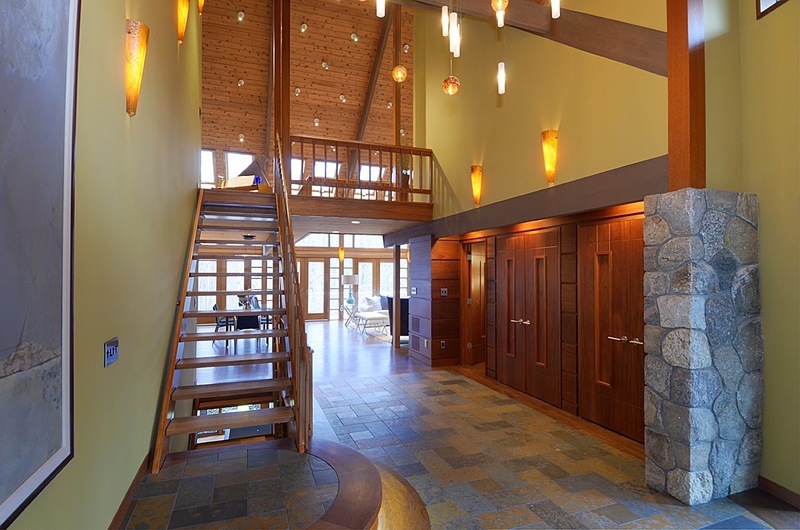 The stunning modern architecture, with its network of wood beams, walls of windows and vaulted ceilings, invites the outdoors in. 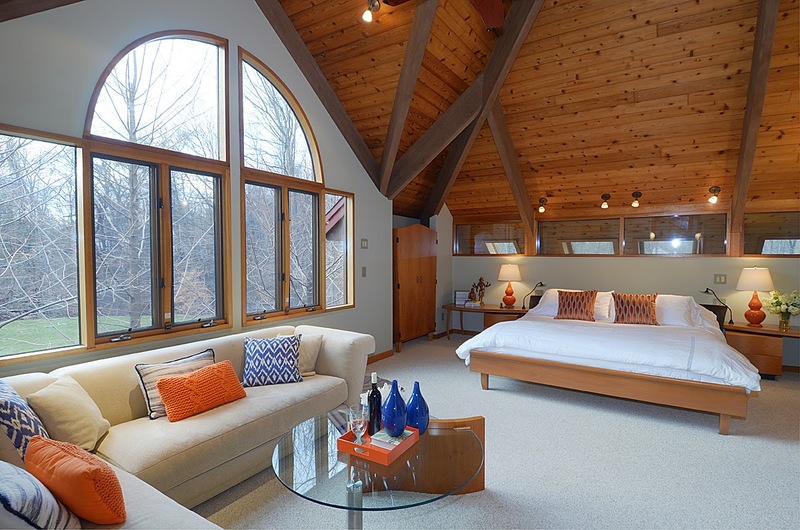 A soaring wood ceiling and a dramatic Palladium window infuses the sensational master bedroom and sitting area with light creating an oasis of serenity. A dramatic glass barn-style sliding door introduces the master bath. 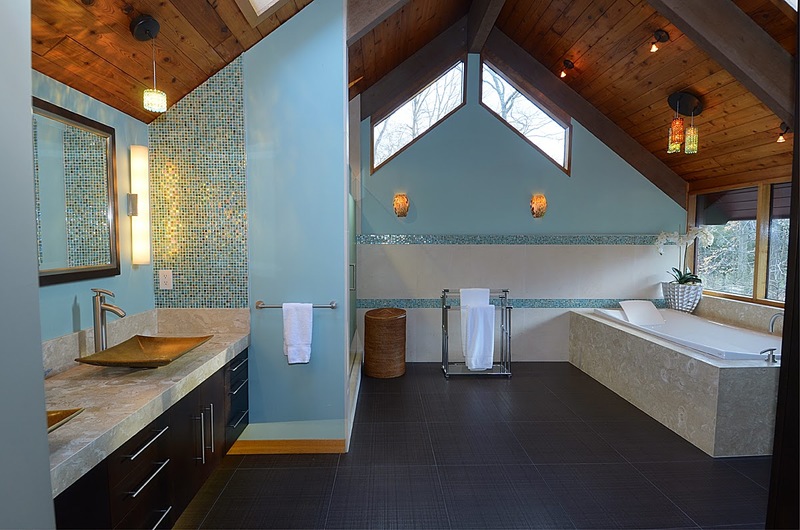 Weathered bronze vessel sinks, oyster limestone countertops, radiant heat flooring, a bubble massage air-jet tub and glass tile walls project a Zen-like feel. 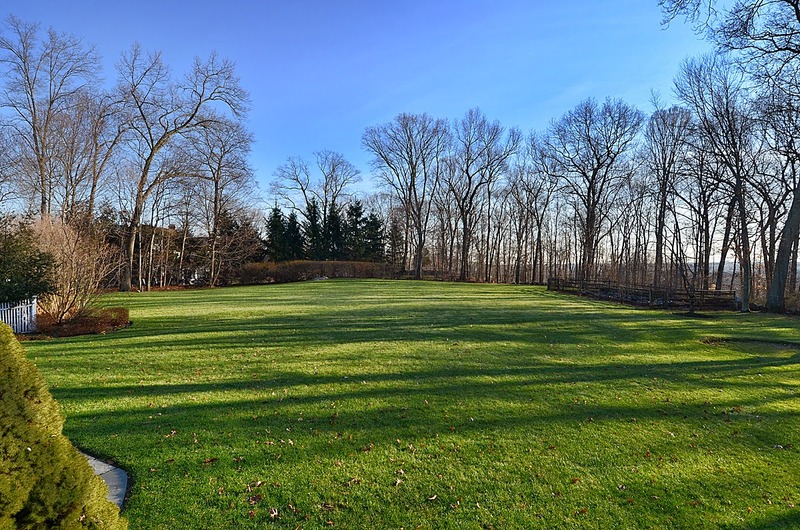 The home is set on 2.17 acres adjacent to conservation land. It offers a private escape minutes from the village, shopping and train station.